Manors of Gaywood and Rising. HODIE 2a vice lecta est Billa, for the Restitution and Assurance of the Manor of Gaywood and Rising to Thomas Howarde, Knight, otherwise called Thomas Howarde, Earl of Surreye. Item, eodem die, 2a vice lecta est Billa, for the Repeal of a Statute made for the Uniting of the Parish Churches of Onger and Grenestede, in the County of Essex, with a Proviso added thereunto by the Lords, que 1a et 2a vice lecta est. Item 2a vice lecta est Billa, against the bringing in of Foreign Wares. Item prima vice lecta est Billa, declaring the Compassing or Imagination of the Death of the Queen's Husband, She living, to be Treason. 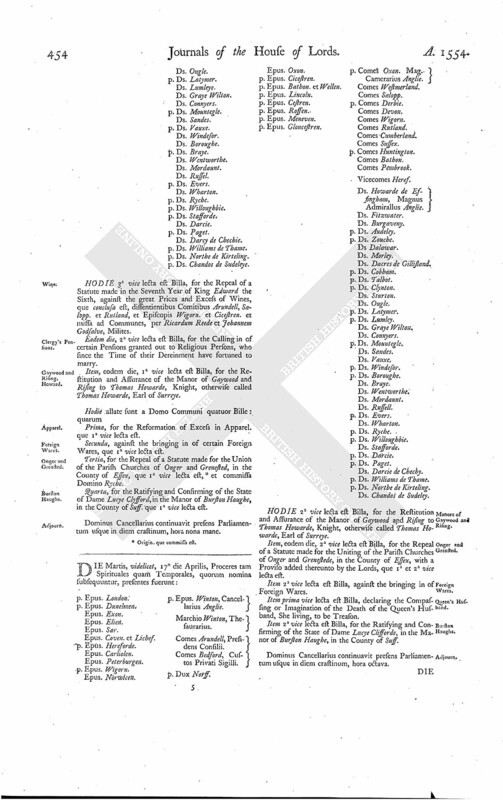 Item 2a vice lecta est Billa, for the Ratifying and Confirming of the State of Dame Lucye Clifforde, in the Manor of Burston Haughe, in the County of Suff. Dominus Cancellarius continuavit presens Parliamentum usque in diem crastinum, hora octava.